Home Alex Gonzaga Edu Manzano Entertainment Instagram Luis Manzano Netizens News Twitter Vilma Santos Governor Vilma Santos and Edu Scolds Alex Gonzaga for hurting their Son Luis Manzano. 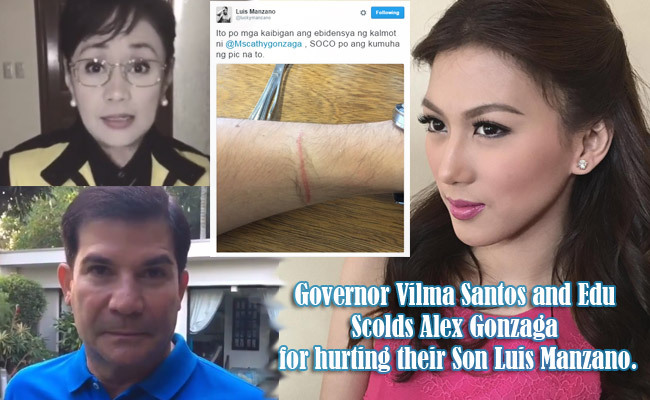 Governor Vilma Santos and Edu Scolds Alex Gonzaga for hurting their Son Luis Manzano. Star for all seasons and Batangas Governor Vilma Santos leave a message to Alex Gonzaga to reprimand her on scratching her actor-tv host son Luis Manzano. Alex herself posted on her official instagram account last March 29 the veteran actress’s message for her. On the said video, Vilma introduced herself as Luis' mother. She then told Alex that she heard a lot of hearsays that Alex has a habit of scratching her son and revealed that she never hurt Luis since he was a child. Alex then caption the video telling Luis that he bother his mom just to complain but she is happy that the actress-politician said I Love You to her. She then tease Luis that she loves the Santos and Manzano family except him. Followers find Alex post funny because they are used to the antics of two witty celebs. After her post, Luis then posted on his twitter less than an hour after Alex posts a picture of his scratched arm made by her as an evidence and jokingly said that SOCO took the picture. Luis co-hosts MJ Lastimosa saw his post and reacted that Alex scratch is more severe than her pinch. On the next day, Luis posted on his instagram account a short video of his dad, Edu Manzano who is threatening Alex that he knows where she lives. Currently, Edu is running for a position in the Senate this coming election on May 9 while Vilma is a re-electionist as a Governor of Batangas. Luis and Alex are known by their followers as close friends where Alex elder sister, Toni was also a good friend of Luis. They are also known for their funny banters on and off the camera and they even had a segment entitled “ ASAP Karaokey” where they are outscoring each other .